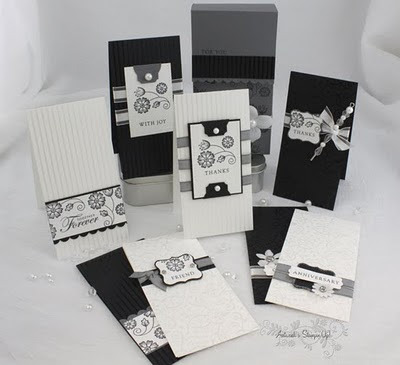 Add a touch of elegance to any occasion with this gorgeous set of black and white cards created using the Bride & Groom Specialty Paper & Stampin’ Up!’s Pretties Kit. In this class you’ll create 8 cards in all – four black cards & four white cards – as well as a unique box to hold them! Order by January 29th, your Class-to-Go will ship out on February 5th. The project guide will be emailed to you. $75 plus shipping includes two stamp sets, paper and accessories needed for this project, PDF instruction guide which has full color photos and step-by-step detailed instructions to complete the custom designed card holder, eight 3" x 6" cards with the small open-ended envelopes . You will need to supply all adhesive and tools - see list below. Order the two stamp sets (115100 Together Forever, 114968 Fundamental Phrases) online at my website by January 29th and I will include the Class-to-Go FREE with your purchase. You will qualify for a free Sale-a-Bration item with your purchase of the two stamp sets! Your product guide will be emailed, and your other Class supplies will mail out February 5th. This product is provided by and will ship directly from me. This class kit is not available for purchase to other Stampin’ Up! demonstrators. If you are a demonstrator and are interested in this class, please email me angelabodas@comcast.net for more information. Refunds will only be processed upon return of all materials provided by me, and a $20 fee for the tutorial will be withheld from the total amount refunded. Cold and Cuddly - and oh so Cute!